A trio of tacos from Comal Next Door. In downtown Berkeley, Comal is nearly ready to debut its first spin-off, Comal Next Door. Taking over the former Phil’s Sliders space, Comal Next Door (2024 Shattuck Ave.) will offer Comal’s take on taqueria fare for lunch and dinner. “We’re excited about bringing some of Comal’s food to a lunchtime audience that we’ve never been able to reach before,” said co-owner Andrew Hoffman. Assuming Comal Next Door passes its inspections today, the restaurant should open later this week with a tight menu of burritos, tacos, and tortas. “We knew all along we wanted it to be really streamlined and simplified and not be the same thing we offer at Comal,” Hoffman said. Comal Next Door’s tacos, for example, will be smaller, street-sized versions simply topped with cilantro, onions, and salsa as opposed to Comal’s large, composed ones. Burritos and tortas, meanwhile, are completely new to the Comal team. 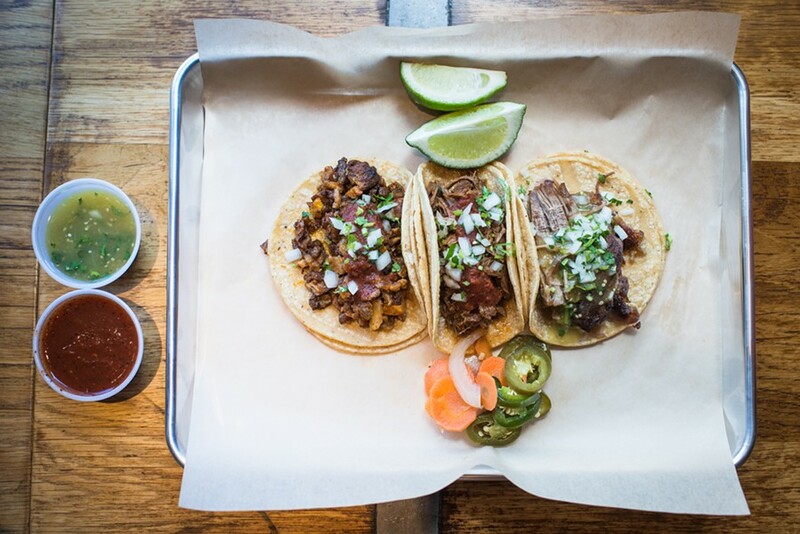 Instead of offering a mix-and-match menu like most taquerias, Comal Next Door will list out every ingredient in each item as partners Hoffman, John Paluska, and executive chef Matt Gandin conceived it. “Each burrito is more of a whole thought as opposed to build as you go,” Hoffman explained. Modifications are allowed, though, and in Chipotle style, diners can request any burrito as a gluten-free bowl instead. Even though the menu is completely different, Comal fans will certainly get a taste of the original restaurant at Comal Next Door. Most of the individual components have been tested at some point, in some fashion, at Comal. And while Comal Next Door won’t make its tortillas in-house, the team is contracting Tortilleria El Molino in Concord to make them along with tolero rolls for the tortas. (El Molino makes Comal’s masa out of specific corn the team buys from Illinois, and Comal Next Door’s tortillas will come from the same corn.) The farmers, purveyors, and quality of ingredients will all be the same, Hoffman said. That also means the prices will be higher than your average taqueria. Hoffman said they’re still working out exact figures, but the hope is to provide a range, such as $6 bean and cheese burrito to a $12 beef barbacoa burrito. “We want to be able to appeal to a lot of people but we also don’t want to sacrifice on ingredients,” he said. Even though Comal Next Door has a full liquor license, there isn’t enough space to build a bar. For now, the staff will utilize a frozen margarita machine in addition to offering beer. The small spot holds roughly 20 seats — 80 percent of the restaurant is devoted to the kitchen, which means Comal also finally has room to expand its catering program. Hoffman said he hopes to launch lunchtime office catering options out of Comal Next Door in the near future.